Boston marathon bombing: All the mistakes journalists make during a crisis like the Boston attacks. A journalist’s guide to tweeting during a crisis. 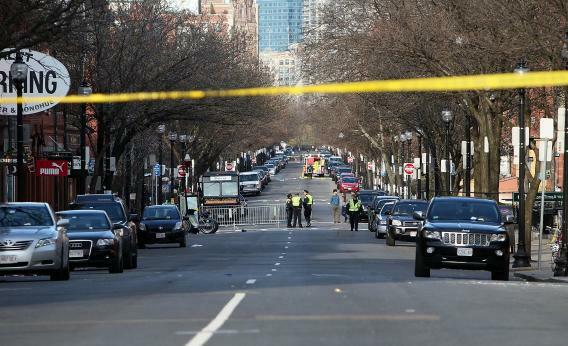 The outter perimeter near Massachusetts Avenue and Newbury Street is secured by police after two explosive devices detonated at the finish line of the 117th Boston Marathon on April 15 in Boston. If you were watching television on 9/11, then you probably remember the early initial reports—later proven false—that a car bomb had exploded outside of the State Department. This mistaken bit of speculation, which spread widely during that day’s chaos, was later used as “evidence” by those who accused the government and media of complicity in the attacks that brought down the World Trade Center. 2. Reporting will skyrocket. Items that ppl ignored will now b called in. 3. 1st reports will change. 4. Don't RT sensational/extreme tweets. Rumors don't help. 5. For spokesppl, don't rule 2 much in/out. Wait till you know. Fleischer’s advice is wise, but as the voice behind Slate’s Twitter feed, I have a few more thoughts about what journalists, news organizations, and anyone else with a Twitter account should do during a national tragedy like what happened today in Boston. First, media outlets need to turn off their automated Twitter feeds to ensure that frivolous and/or off-topic items don’t get sent out by mistake. You don’t want to be tweeting about the tax benefits of the state of Texas while limbs are being amputated in Boston if you’re @GovPerry, or—ahem—the latest “Dear Prudence” column if you’re @Slate. Second, use first-person eyewitness accounts and official sources like the Boston Police department’s Twitter account or official press conferences. Always cite these sources directly, and don’t rely on people who’ve heard something on police scanners—a notoriously unreliable source if you’re looking for solid, confirmed information. Though the wire services are typically the most reliable and first to know, they’ll still get plenty of things wrong in the first few hours of a breaking news frenzy. (The AP filed a false report early in the afternoon, which was picked up by Slate and others, indicating that authorities had shut down cellphone service in Boston in order to prevent remote bomb detonations.) Also, look to local sources. The Boston Globe was one of the best sources of verified information and eyewitness accounts on Twitter and the Web in the immediate aftermath of the attack. Now, here’s a much longer list of what not to do. First, do not pass on speculation. For much of the day, the New York Post was sharing unconfirmed reports, which were later proven erroneous, that 12 people had been killed in the attack. I actually retweeted BuzzFeed’s Andrew Kaczynski, one of the smartest and most conscientious journalists on Twitter, and repeated this tidbit on the official Slate account. In hindsight, it would have been wiser for both of us to broadcast that news in more skeptical terms. At times, I have succumbed to the desire to be the first source to pass along a story, and I’ve gotten burned. Slate was one of the first outlets to tweet out that we had found the likely Facebook page of the man who was then being reported to be the Newtown shooter, Ryan Lanza. Shortly after that report, it was discovered—by, ironically, the New York Post among others—that the shooter wasn’t Ryan, but his brother Adam. In reporting that CNN’s Susan Candiotti had named Ryan as the shooting suspect, I was very cautious to cite a mainstream source. It turned out that the source was wrong, and this was one of the most embarrassing mistakes I’ve made as a journalist. Not writing on Boston. It is a local crime story for now. A lesser version of this most egregious Twitter sin of political point-scoring is to offer political analysis before there’s any actual information available. On his blog today, Slate’s Dave Weigel summed this point up rather nicely. The early hours are the time for the local news media to do reporting, and the national media to do its best possible job of fact gathering and sharing. Finally, don’t retweet trolls. This may seem like an obvious one, but it can be hard to control yourself. What Alex Jones says is not news. It’s his job to float outrageous conspiracy theories. And our job is to ignore him. Read more on Slate about the Boston Marathon bombing.